Better than Paper understands the importance of maintaining the confidentiality of any information you may provide while using our Site and the Better than Paper platform. In general, we gather information about all our users collectively, such as what areas of this Site are visited most frequently and which of our services are accessed the most. We only use such data in an aggregate form. This information helps us determine what is most beneficial for our users, and how we can continually create a better overall experience for you. We collect information and data when you register for a trial account on our Site, subscribe to our newsletter, fill out a form at an event, or enter information on our Site via the Get in Touch form and Free Trial form accessible via the main navigation menu. When completing a form on our Site, as appropriate, you will be asked to enter the following information: your name, phone number, e-mail address, company details and product questions to tailor our response with you. Better than Paper use a UDID collection service for all of our iOS Dynamic apps. The data is completely anonymous and no other information will be collected. The UDID capture is used ONLY for restoration of subscriptions and previous purchases. Unlike many other mobile applications, we do not use this unique identifier to push any other services, whether it be adservers, purchasing history, likes and interests – this service is purely for restoration of items and subscriptions you may have purchased. Better than Paper will never sell, or share personal information with third parties. We may use this information to serve those users who have requested to be mailed with topics and content that they may be interested in, such as Site, case studies, product and services, and company news. Cookies are used for internal research and to give a better understanding of our audience. You should also be aware that if you link out to third party websites, they have their own privacy policies for which Better than Paper can accept no responsibility. Please be certain to check other sites before use. We may release your information when we believe release is appropriate to comply with the law, enforce our Site policies, or protect ours, or others rights, property or safety. However, non-personally identifiable visitor information may be provided to other parties for marketing, advertising, or other uses. A cookie is a harmless piece of information that a website transfers to the cookie file of the browser on your computer’s hard drive. On visiting the Site, a cookie will be placed on your computer automatically by the Site. ‘Session cookies’ are temporary cookies that remain in the cookie file of your browser until you leave the Site and ‘Persistent cookies’ are cookies that remain in the cookie file of your browser for much longer (though for how long will depend on the lifetime of the specific cookie). Better than Paper does not use its ‘Persistent cookies’ or ‘Session cookies’ to store personal information about you. Better than Paper uses its cookies for monitoring load balancing between its servers while you are linked to the Site, to conduct analyses of user traffic, and to perform web log audits. Third party advertisers may serve cookies via this website, but these are only used to serve advertisements from the website’s ad servers and to track whether these advertisements are clicked on by visitors to the Site. Better than Paper may pass the non-personal information collected by its cookies to third parties but only for the purposes of carrying out such monitoring, analysis or web log auditing, or for the purposes of tracking the number of anonymous users of the website. Most browsers accept cookies automatically, but you have the ability to accept/decline cookies by altering the settings in your browser. If you decline/disable cookies, you may not be able to use all the interactive features of the Site or the Site may not be available to you. For further information about disabling cookies, you can visit http://www.allaboutcookies.org. If you choose to decline cookies, you may not be able to sign-in or use other interactive features of the Site and services that depend on cookies. The Site is protected against unauthorised access using the latest security devices and firewalls. Better that Paper will not use or share the information provided to us through the Site in ways unrelated to those described above without providing you with notice and an opportunity to opt-out of such unrelated uses. Better than Paper offers its Site visitors a means for controlling the use of session information. If, at any time after registering for information, you change your mind about receiving information from us or about the use of information volunteered by you, or if you no longer wish to receive emails or other messages from us, please send a request specifying your new choice to privacy@betterthanpaper.com. Alternatively you can call us on +44 (0) 203 005 5343. 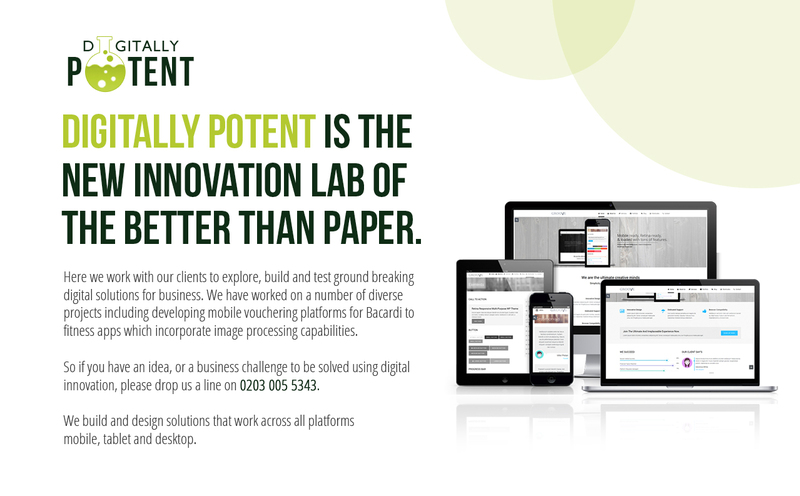 Better than Paper's publishing platform enables businesses to instantly create personalised digital content platforms across all devices. We do this by intelligently filtering data and content from the web and mix it with your brands owned content in real-time. It would be great to talk with you about your content publishing needs, please contact the team to set up a call. Copyright © 2019 Better than Paper. All rights reserved.